Do you have a strange urge to gather up barrels so you can hurl them at a certain Italian plumber named Mario? Are you prone to breaking out a set of bongos to defeat your enemies? Do you have some mad skills throwing turtle shells while driving a go kart? Okay, so most normal people don't do any of those things, but that's how Donkey Kong has lived his life, ever since his humble beginnings in 1981 as the bad-mannered ape who stole Mario's gal. Of course, the Kong family has since changed their ways and now he's more of a party animal, busting out a set of bongos every chance he gets (it's a part of his anger management routine). If you want to be a party animal like the famous gorilla, then you'd better get this licensed Nintendo costume! 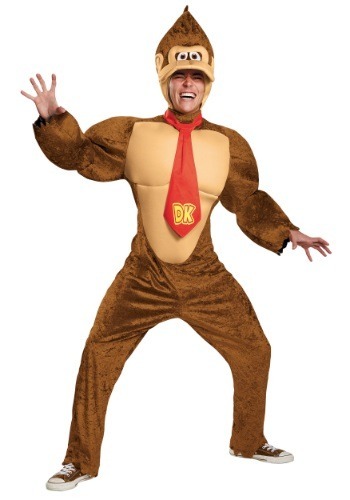 This Deluxe Donkey Kong Costume brings you a style straight from the video games. The jumpsuit has the gorilla's big, bulky muscles designed right into the costume, so you don't even have to start pumping iron to get the buff ape look! And, of course, it comes with D.K. 's tie on, since he's one classy gorilla. To become the life of the party, we suggest grabbing a set of bongos and thumping out one wild jungle rhythm while you wear it.